These days, it seems, race issues are at the forefront of the news. You say the word ‘Ferguson’ and everyone knows what you mean much in the same way if you would say ‘Selma’. The movie ‘Selma’, itself, became a topic of controversy when it’s director and star, both black, were not nominated for Academy Awards. States controlled by Republican majorities are constantly trying to roll back voter’s rights. Latino children are vilified at the border and black men are being shot in the back by police in South Carolina. Art has always been a reflection of the times. Through film, plays and television, artists have been able to comment on race while also entertain. Many times, however, they choose to show stories that take place in the past such as 12 Years A Slave (which won best Picture two years ago), Lee Daniels’ The Butler and most recently, Selma. Television shows like I’ll Fly Away (1991-93) and American Dreams (2002-2005) dealt with race through the prism of the 50s and 60s respectively. One of the best shows of the last twenty years was The Wire (2002-2008). The show did not primarily deal with race at its core but it attempted to reveal how the police, the government, the schools, the laws and the media warped by corruption and opportunism can eat away at a city, a community and thereby institute a system which in itself is racist. The characters were rich, the stories heartbreaking and no matter the good intentions of some, there was no getting out from under. The new show by writer John Ridley (Oscar winner for 12 Years A Slave) is called American Crime. It’s an ambitious story that attempts to deal with how people’s perceptions of others are tainted by the color of their skin or by past experiences. It starts with a call in the middle of the night to Russ Skokie, played wonderfully by Timothy Hutton. He needs to come to Modesto, California. His son has been murdered and his son’s wife beaten to near death and in a coma. Russ’ ex wife Barbara (Felicity Huffman), is a hard woman who has not forgiven Russ for failing them by letting his gambling problem drive them apart and into poverty leading them to live in the mostly black projects of Oakland, California. Their son’s wife’s parents, Tom and Eve (Deadwood’s W. Earl Brown and Penelope Ann Miller), are a solid middle class couple devastated by what has happened to their beautiful daughter. Carter, a young black man, and Aubrey, his white junkie girlfriend, are barely surviving which leads Carter to rob a drug dealer for just enough to get high. A widowed Mexican father, Alonzo (The Shields’ Benito Martinez) trying to protect his teenage son and daughter perhaps a little too much and overbearingly. We start to see the tapestry being laid out and eventually all of their lives will intersect. The crime will lead all these characters to question their own place in the world as they get caught up in the legal system and their own self recriminations. As the case unfolds the pressure intensifies and threatens the façade that each has built to shield them from their own truths. The show shares some similarities with the film Crash (2004) written and directed by Paul Haggis. Both are ambitious attempts to deal with race and prejudices using interconnecting story lines and a large cast of characters. 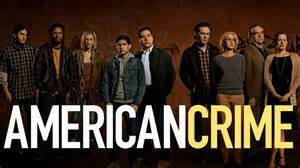 But while Crash may have felt forced or preachy, American Crime feels uncomfortably familiar and authentic. American Crime reminds me more of the film Lone Star (1996) written and directed by John Sayles. There, too, race is examined through the prism of a murder mystery and the characters feel authentic. The cast does fine work. The acting is very low key and natural. These are people we all know and can identify with. Watching the story unfold you feel as if these characters are just pawns in a situation that is beyond their control and it is heartbreaking. The show is on ABC Thursday nights at 10pm.